In part of our final class about measures taken to mitigate road mortality due to habitat fragmentation, Dr Evans talked about several wildlife connectors (e.g. the bridges for arboreal animals at Hume Freeway, Australia). While I agree that such corridors can help to prevent problems like inbreeding and subsequently, genetic isolation, I wonder about the effectiveness of these wildlife connectors in the long term. 1) If animals in the area become habituated to the structures, would they become less effective? For instance, large, carnivorous mammals might become aware that the smaller mammals (prey) utilize the connectors and hence, “camp out” along these corridors to ambush any of the prey that may come along. If this happens, smaller mammals may start to avoid these connectors since risk of danger becomes higher. Furthermore, attempting to escape along the narrow/constricted corridor might be much harder than in the open forest. 2) Dr Coleman also adds that such wildlife corridors have contributed to human-wildlife conflict. Since one of the wildlife corridors in the town of Canmore, Alberta, lies within a major training area for the summer Olympics atheletes all over Canada, there have been cases where runners and cyclists were attacked by bears. Such human-wildlife conflicts have ended up with fatalities and authorities have been coordinating efforts to minimise such conflicts. One way is by restricting people to designated trails and wandering off the trails not shown on trail maps or posted signs are illegal. Visitor information on how to “be bear smart”, “be elk wary” and “be cougar alert” have also been made available. Hopefully, as more people learn to live with wildlife, human-wildlife conflicts would decrease. Since such wildlife corridors are generally expensive to construct (e.g. the EcoLink project in Singapore was estimated to cost $17 million), it certainly wouldn’t make sense if the success were only short term or if human-wildlife conflicts increase to dangerous levels. Can the long-term effectiveness of these wildlife corridors be justified? Just a short post about something I thought was interesting. Last weekend in Bangkok, I visited the Damuan Saduak Floating Market. Richard, a Thai friend who shows us around whenever we’re there, said let me bring you to a coconut plantation! I imagined typical fields of coconut trees and a hut selling beer and I Love Thailand magnets. It wasn’t quite like that. 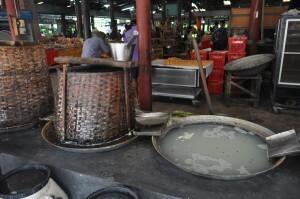 Richard tells us, the coconut sugar is taken from the coconut flower and picked from young trees before they start fruiting. The coconuts are harvested and juice extracted, meat made into desiccated coconut and milk, husk made into every kind of product possible (including furniture) and sold in the hut/shop. Many small-scale farmers convert their restricted land space from mono-culture plantations to multi-functioning systems with better managed irrigation and multiple crop harvest. This not only involves more members of the family, it also brings money in quicker. 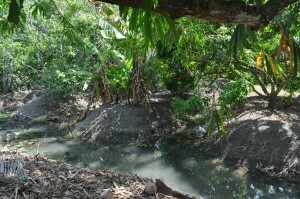 A quick google search later, I found that the Damuan Saduak canal links the Tha Chin and Mae Klong rivers. The Tha Chin River is the major distributary of the Chao Phraya River; both rivers and their distributaries form the Chao Phraya Delta. 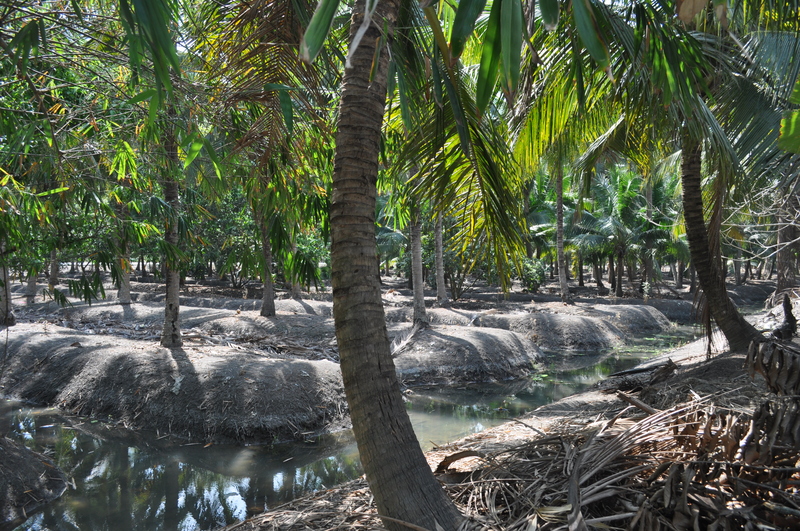 The distributaries of this delta are interconnected by canals such as where this floating market is, that serve to irrigate crops and for transportation. 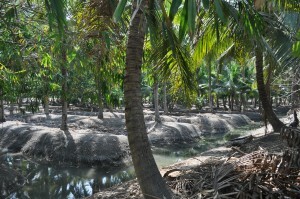 Just like how every part of the coconut plant is used, every inch of this land plot has a purpose. The space between trees used to farm fish, the small open space behind the coconut sugar ‘bakery’ made into an attractive garden. 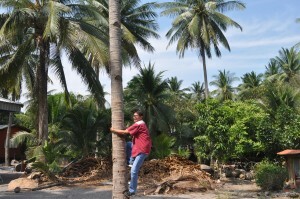 We see the owner teaching a group of Korean ladies to climb a coconut tree (with footholds already carved). I wondered what the implications on biodiversity there could be. Would a more heterogenous-use (is this right?) land support a more diverse range of species compared to previously homogenous land with just coconut? Would the influx of tourism shift the focus away from agriculture to developing land for more urbanised use? From a brief read online, I see that controversy surrounds the Chao Phraya river basin: much of the original swamp forest of the Chao Phraya river basin was cleared to become agriculture or urban development (like Bangkok). Wildlife that once lived in the plains have disappeared, mostly fish and birds and some animals such as Asian elephants and tigers. Environmental damage from large scale shrimp production and use of pesticides not only implicates the agriculture but could have long term effects on small scale farmers along the river basin and larger delta area. I can’t seem to find any concrete plans by the Thai authorities on controlling the urban and industrial development. Will the environmental damage done to the larger delta area affect the tributaries and eventually small-scale farms like this? If so, what can be done to mitigate this? ICUN 1991. The Conservation Atlas of Tropical Forests: Asia and the Pacific. London and Basingstoke: Macmillan Press Ltd.